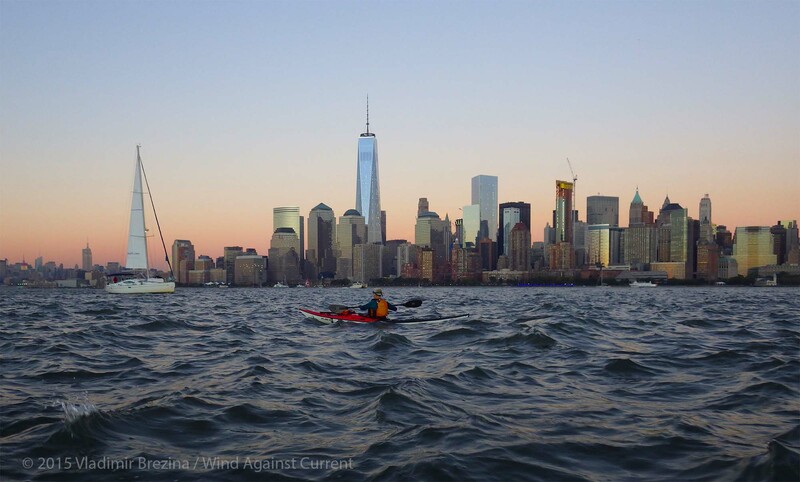 This entry was posted in Kayaking, New York City and tagged Kayak Photography, Kayaking, Manhattan, New York City, New York Harbor, Photography, Sunset. Bookmark the permalink. It’s the magical lighting on a night like that… Thanks so much, Tish! I like these pics so much I reposted on Facebook. Lovely, indeed. What gorgeous views and the light is so beautiful! Actually, we usually travel from Pier 40 to points south, and in reverse when returning, distinctly on one side of the harbor or the other: either on the Brooklyn side, which means via the Battery, the west side of Governors Island, and the Bay Ridge Flats anchorage, or on the Jersey side, via Ellis Island and the Statue of Liberty. We try to stay out of the main shipping channel, although sometimes we of course cross it and in any case in many places the channel is not well defined—medium-sized boats such as ferries and tugs, and even large ships, go everywhere. 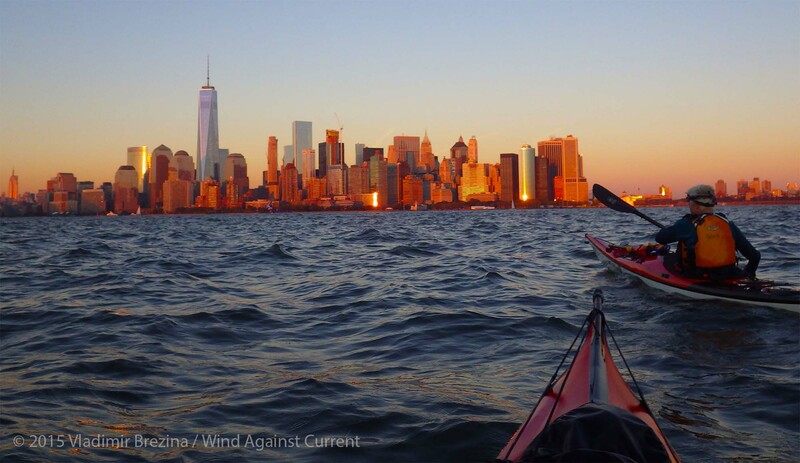 In this video we were paddling up the Jersey side, via the Statue of Liberty, Ellis Island, and the mouth of the Morris Canal. 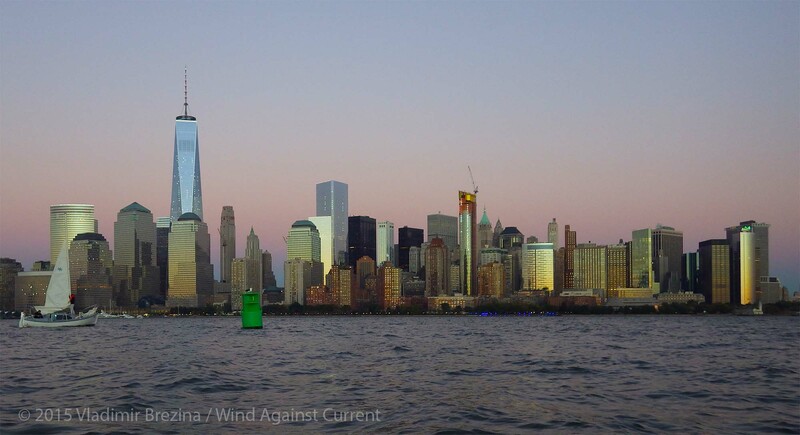 In the last two segments, we started crossing the Hudson to Manhattan, roughly at the level of Battery Park City. It’s hard to tell any of the above from the actual video because the GoPro has a fish-eye lens, so everything appears to be far away, and distant features appear to be equally far even if they are not. We were actually much closer to the Jersey side than to Manhattan. The video footage is such a fun addition to the still images. The water in the still images would have seemed somewhat “rough” to me, but the video suggests it was pretty smooth paddling? Why thank you Kat! As a matter of fact, it was somewhat bouncy. When we stopped to put on our lights, we (naturally enough) picked an area that was reasonably calm… which is where the video was filmed. There are many opportunities for kayaking in northern MN if you haven’t had a chance to explore this region — and great photo ops, too! …. the GoPro is providing a whole new perspective to many adventures, which is a lot of fun. 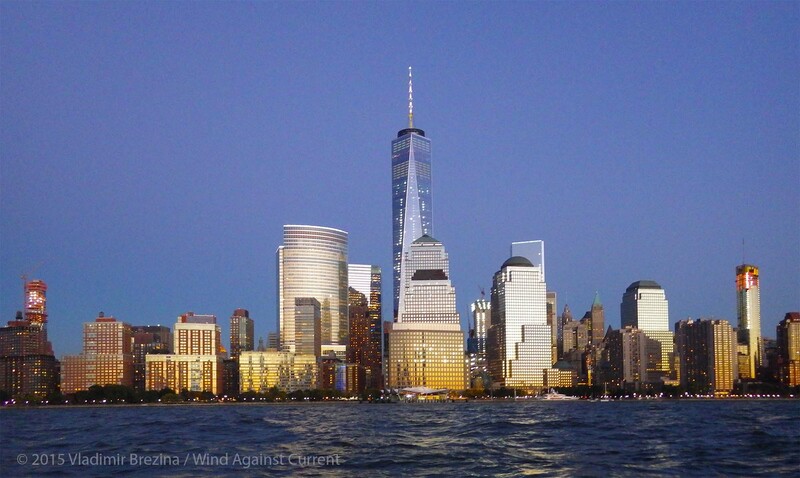 How interesting to see the way the change of light changes the appearance of the buildings. Vlad!! You have the video of me miaowing at you! How embarrassing. What would have been better is if you could have captured the Yellow Taxi yelling at us about not having lights on–when we actually did!! Except that you’ll look like a total dork :-). But one must sacrifice for one’s art… I just hope I get some good shots of you!! Love the changing colors, and the GoPro is really, really fun to watch – especially after seeing your photos for so long, now we see you taking them and feel like we’re on the water with you. I love the video. Thanks for taking me along on a virtual paddle. You are most welcome, Anne!! 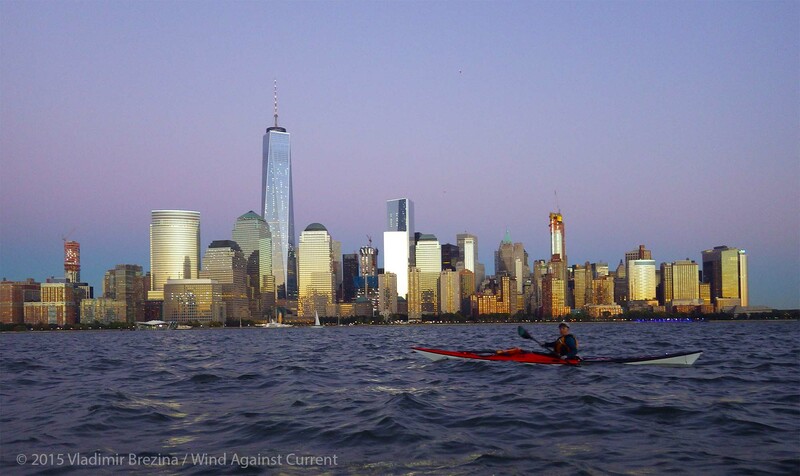 Thank you for your Go Pro Shot of your pause to turn on your safety lights at sunset … I just purchased the Techno Lights from Kayalu after using a different system for night paddling — your bow lights in the Go Pro shots are mounted differently than I expect to mount mine …. perhaps you are using a different bow light system…..
Great shots and many thanks to both of you for your wonderful pictures and reports. On the question of lights, we’ve tried a few lighting systems that turned out to be unsatisfactory, mostly because the lights were not truly waterproof, or were waterproof only for a short while. It’s also hard to mount most kinds of lights on a folding kayak with a flexible skin. The lights in the video (eGear—but they may have been discontinued) are a bare-bones solution. The way we have them mounted is not strictly legal—the lights’ visibility is not restricted as legally required—but it works: boats that have come close have always seen us, so far, although they are usually confused at first about the identity of the strange lighted object. Red and green lights are actually not even required for a “vessel under oars”. The rule is that “a vessel under oars may exhibit the lights prescribed in this rule for sailing vessels, but if she does not, she shall have ready at hand an electric torch or lighted lantern showing a white light which shall be exhibited in sufficient time to prevent collision”, which we also have.